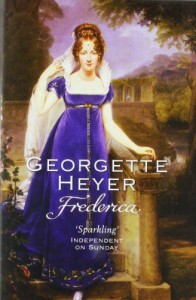 I have always enjoyed Frederica, which like most of Georgette Heyer's novels I first read in my teens. And I still enjoy it, not least because of the truly charming portrayals of Frederica's young brothers and their dog: Jessamy, a budding scholar and minister at 16, who nonetheless has a passion for horses; Felix, who loves everything mechanical and at 12 cannot imagine that anyone would not share his glee at the prospect of a foundry, a steamboat, or a hot-air balloon; and Lufra, the "Baluchistan hound" who catapults the family into one scrape after another as he tears around London protecting his family from cows in the park, misthrown rubber balls, and other dogs. Similarly, Lord Alverstoke's various relatives are gorgeously realized, each a distinct and often funny personality. The main reason I don't give this one five stars has to do with Frederica and Alverstoke themselves. 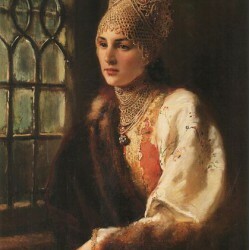 Although I see that Frederica's devotion to her family—she has brought them to London to find a suitable husband for her exquisitely beautiful (if more than a little dimwitted) younger sister—acts as a flaw to the extent that she can't imagine her siblings wanting something different from what she wants for them, she remains so self-sacrificing and modest that these days I find her a bit hard to take. Her spineless sister, who "has a great deal of sensibility," can be even more annoying. And is an elegant marquis, however handsome and desirable, really good husband material if he is perennially bored and, at least at the beginning of the book, disinclined to put himself out for anyone? Although, it's true, the boys alone are enterprising enough to eliminate the marquis's chances of being bored in the future. And Frederica, if a bit too good to be true, is charming. The style of the book is lively and entertaining. So if you love Regencies, definitely give this one a whirl.